Add relaxing in the cozy CorLiving Oakland collection to your exciting summer plans. The PPO-801-O Ottoman with deep seat matching the design of the rest of the Oakland series. The Textured Black resin rattan weave is complimented by high quality, weather resistant foam seat cushions wrapped in washable Dove Grey woven seat covers. Just add the legs and this piece is ready to use upon delivery! Complete your summer with a comfortable Oakland patio set from CorLiving. North shore is reminiscent of contemporary low profile furniture. Designed to sit closer to the ground, this sleek collection maintains discrete elegance that gracefully harmonizes any dicor and design scheme. Made with resin weave, North shore is hand-woven over extruded aluminum frames that are fully welded and powder coat finished. The generous scale makes it ideally suited for grand indoor and outdoor rooms, while the low profile combines understated styling with durable materials that are essential for casual living. Seating pieces include a lounge chair, ottoman, loveseat, sofa and an infinite adjust hydraulic chaise lounge. The coordinating occasional and coffee tables have innovative Resinwood tabletops for durable wear. All cushions are designed to complement the environment while providing the same comfort level as fine residential upholstered furniture offering flexibility and instant recovery. Cushions are made with exclusive Sunbrella<sup></sup> performance fabrics with high quality pigments that result in enduring, consistent and vibrant colors. Relax in style and sophistication, and enjoy the outdoors with the Beacon Ottoman. A sturdy, rust-resistant frame supports intricately woven, rich brown wicker, and features a plush olefin cushion. Use as a standalone piece, or include other Beacon Park furniture elements to create a complete look. Enjoy your outdoor space with the Hampton Bay Laguna Point patio furniture set made with beautifully hand-woven wicker and durable steel furniture frames. The set includes plush weather resistant cushions for ultimate comfort and longevity. Perfect for your porch, patio or sunroom, each patio furniture set includes two ottomans. 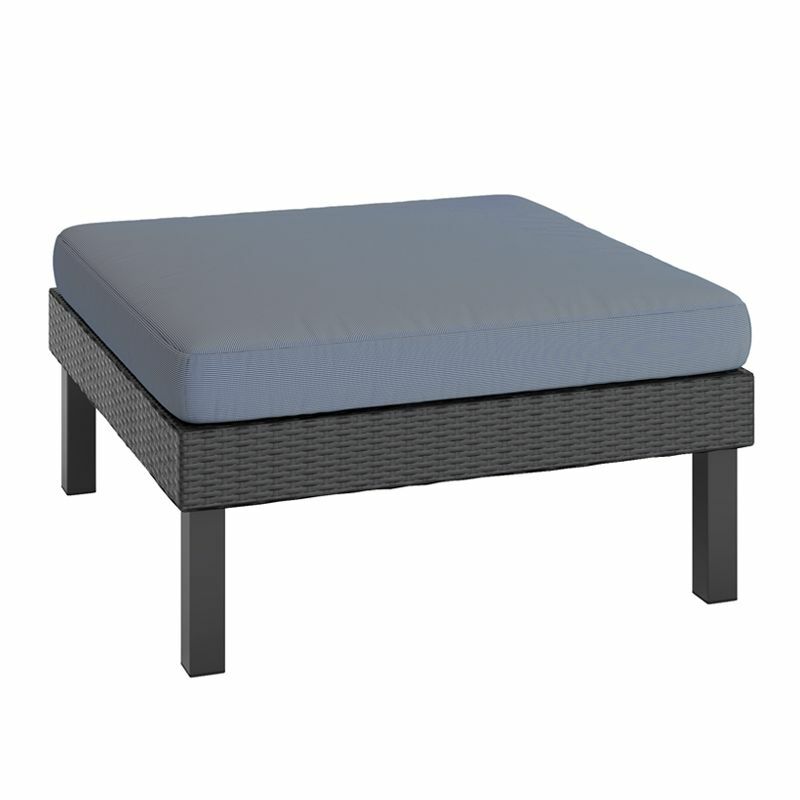 Oakland Patio Ottoman In Textured Black Weave Add relaxing in the cozy CorLiving Oakland collection to your exciting summer plans. The PPO-801-O Ottoman with deep seat matching the design of the rest of the Oakland series. The Textured Black resin rattan weave is complimented by high quality, weather resistant foam seat cushions wrapped in washable Dove Grey woven seat covers. Just add the legs and this piece is ready to use upon delivery! Complete your summer with a comfortable Oakland patio set from CorLiving.